This holiday season, let’s skip the store-bought cookies and take a bite out of Christmas with this simple dessert recipe for Eggnog Knot cookies. This recipe blends the rich eggnog flavours of nutmeg, cinnamon and rum making these Christmas treats taste and look festive. If you thought I went bananas for all things pumpkin spice it shouldn’t come as a surprise that I love Eggnog. I love it in a morning latte and I love it spiked with rum before I go to bed. I’ve even heard it makes the most delicious French toast ever! Who doesn’t love a glass of rich eggnog? From Thanksgiving all the way to New Years Eve it’s one of my favourite holiday indulgence. 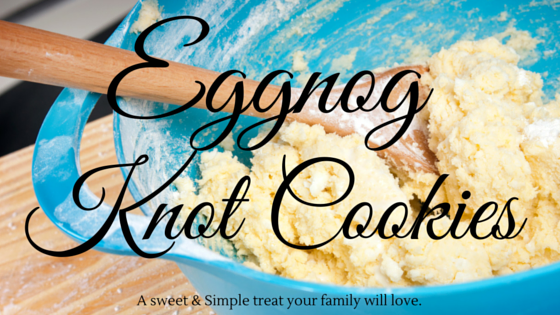 Enjoy all the flavours of eggnog in a sweet, simple knotted cookie that is guaranteed to be a hit on any festive cookie platter. When glazing the cookies, place the cooling rack over waxed or parchment paper to catch any drops and make cleanup a breeze. In large bowl, beat butter with sugar until fluffy; beat in egg yolks and rum. In separate bowl, whisk together flour, nutmeg, baking powder and salt; stir into butter mixture, blending with hands if necessary. Divide into quarters. Roll each quarter into 10-inch (25 cm) log. Cut logs into 1-inch (2.5 cm) thick slices. Work each slice with hands until malleable and smooth. Roll each into 6-inch (15 cm) rope; tie in knot. 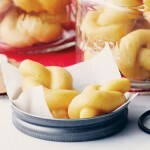 Place knots, about 1 inch (2.5 cm) apart, on parchment paper–lined baking sheets. Bake in 300F (150C) oven until golden and browned on bottoms, about 25 minutes. Glaze: In heatproof bowl, mix together icing sugar, rum, water and nutmeg until smooth. Place over saucepan of simmering water; whisk until slightly warm. Remove from heat. With fork, dip warm knots into glaze, rewarming glaze if necessary. Let stand on rack until dry and cool, about 30 minutes, using spatula to loosen. How do you enjoy your eggnog? « We weren’t going to get Elf On The Shelf. YES, yes, yes! We are huge egg nog fans and I never thought of cookies. YUM! My husband is a huge eggnog fan. He would love these! I have never heard of these but I am off the week after Christmas and might just give these a try – I will let you know how they turn out. Happy Holidays! I have never tried eggnog cookies before! They sound delicious! What a great recipe. I love eggnog so i bet these would be delicious! I’ve never heard of knot cookies! How fun are these?! I love the simple know look and I’ll be these cookies are delicious! I think we might add these to our cookie trays! I honestly don’t think I’ve ever had Eggnog… But these sound pretty good, might have to make these for Christmas Eve! I tried it for the first time not too long ago. I think the nutmeg flavor is perfect for the holidays. Egg nog is one of my favorite drinks. It is wonderful to be able to make a delicious cookie treat with it. I never thought to make eggnog cookies, but they sounds quite good actually. What a great way to enjoy the flavor of eggnog. I think these sound great! I love the sound of eggnog cookies. During this season, eggnog is one of my favorite drinks to keep around the house. I’ve never thought to make eggnog cookies. What a fab idea. Will give this a try, I’m sure they’re super delicious. Oooo egg nog cookies!!! I love egg nog and cookies, so this is perfect for me! Great-looking recipe for the holidays! You have written an easy-to-follow procedure as well. These sound so yummy! I am adding them to my holiday cookie list! They’re so cute! I can see them being an absolute hit at any holiday party. I am going to try to make the knot cookies. Oh this is such a cool recipe. My boyfriend in particular would be happy with some cookies like this. The guy is crazy about eggnog! I wish I could see a picture of how this cookie is made. Sounds delicious. My boys would LOVE this recipe. They are eggnog fanatics. This is a nice festive recipe! These sound absolutely delish! Rum glaze is truly going to make these special. TY for sharing! They sound delicious. And what could be more perfect for holiday time? I’ve never had eggnog cookies, so I’ll definitely have to give these a try! They sound delicious! Thanks so much for the recipe! Oh man, you have me drooling over here. Those sound ah-mazing.